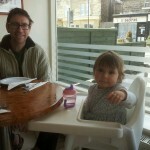 Matt has the day off today, so he, Annie and I enjoyed brunch our local Italian bistro ‘Cafe Rosso’. The food was delicious. We all shared a massive plate of antipasto and toasted breads beautifully rounded off by a coffee and biscotti. What a lovely Friday treat.